Hillsboro City Councilman and Utilities Committee Chairman Brandon Leeth speaks at a Utilities Committee meeting Monday evening. Hoping to fund critical improvements to its crumbling storm sewer system, the City of Hillsboro may soon charge residents for storm sewer service. Prior to Hillsboro City Council’s monthly meeting on Monday, the Utilities Committee, chaired by Councilman Brandon Leeth, heard from Gary Silcott of Stantec Consulting Services about creating a stormwater utility — an extra bill to generate revenue for the storm sewer system. Silcott said if Hillsboro wants to comply with Environmental Protection Agency regulations, make needed repairs and replacements, and keep stormwater out of the sanitary sewer system, it must create a stormwater utility. Due to outdated storm sewer infrastructure and a lack of funds to pay for maintenance and improvement, millions of gallons of clean rain water are flowing into the city’s wastewater treatment plant and mingling with sewage, wasting thousands of dollars on chemicals and treatment processes that could be reduced if the rain water was diverted elsewhere, according to Leeth. Silcott said the city owns miles of storm sewers that are either old, damaged, penetrated by tree roots or even nonexistant. The system is in need of video inspection and cleaning, as well as repairs and replacements, but due to budget cuts, there is not enough revenue coming in to pay for such things. Silcott added that the EPA is now requiring local governments to implement control measures dealing with pollution prevention and construction site runoff, which can be costly. 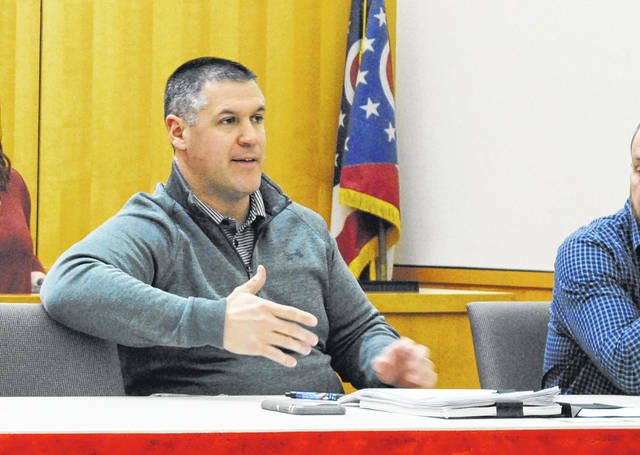 To offset the costs of keeping the storm sewer in good shape and the EPA at bay, Silcott said the city should create a stormwater utility. Silcott said the utility is a stand-alone service unit within the city government generating revenue through fees. The revenue goes into a separate fund that can only be used for stormwater services, he said. Silcott said as of 2017 there were 106 stormwater utilities in Ohio and hundreds of others elsewhere around the country. According to Silcott, the average cost is $5.18 per month. Silcott said if Hillsboro implements the suggested billing rate, it could generate $41,485 per month. According to Silcott, the top 10 customers in the city could be charged as much as $1,000 per month or more, depending on the size of the property and the billing calculation. The next steps for the city, according to Silcott, are to determine a billing rate, decide how to bill city parks, treatment plants and other buildings, consider discounts for larger users, adequately notify the public, and approve legislation creating the utility. Silcott said having the public on board with the utility is important to the process. In other utility business, council later in the evening heard a first reading of an ordinance adding an extra $3 base fee to residents’ water bills. Council approved similar legislation in March 2018 with a $3 increase. At the time, Leeth and others said current revenue is not enough to pay for water system costs.